On the top floor is a huge round bed, covered with a “love quilt” made at the project. The middle room has twin beds, so the Tower is ideal for a couple wanting a romantic night, or an adventurous family wanting a completely unique experience. 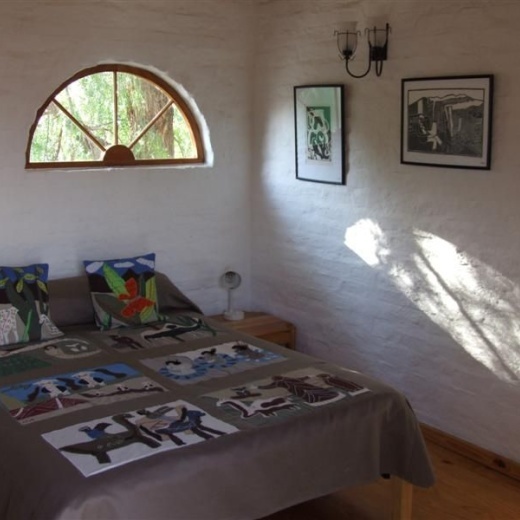 Beds are covered with Arts Centre quilts, and the walls are covered with art-work made at the Centre. A beautiful stone courtyard with its own Braai offers privacy and charm in an outdoor setting. Here you can gaze at the famous Bethesda night sky while you sip your wine in safety and privacy. Nights spent in the Centre’s friendly, quirky accommodation, will not only give you the chance to meet the local coloured artists, but to know that you are supporting a worthwhile project that is changing people’s lives. The Tower Restaurant IS Open for breakfast, lunch, and dinner seven days a week, the Tower Café has food to suit all palates. Karoo lamb, chicken curry, or cottage pie are typical fare, while lighter meals of soups, salads, and toasted sandwiches are always available. Vegetarians are thoughtfully catered for with an inspiring selection of dishes such as moussaka, tortilla, Thai butternut soup and vegetable curries.